The year started off slow. I struggled to find a book that made me want to keep reading. And then the flood gates opened. One great book begat another, and another, and another. I even found a book that I count as one of my favourite books of all time. Now that doesn’t happen every year. While 2012 is not over, I thought I’d share my list now in case you wanted to pick up one or more of these for the favourite people on your Christmas list. 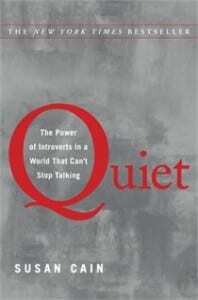 Finally, someone is talking about the fact that being introverted is natural and a good thing. In her book, Susan Cain talks about how introverts are “responsible for some of society’s greatest achievements”, and how we live in a world that misguidedly values extroverted ideals like charisma, teamwork and big personality. Cain makes the case for why introverts deserve more respect, and shows there’s a place for both introverts and extroverts in business, leadership, politics, friendships and families. I devoured this book because as an introvert, I felt like she was writing about me. If you like alone time, prefer to listen rather than talk, and have been called “quiet” on more than one occasion, this book is for you. Or if you have an introvert in your life, as your partner or child, read this book and you will understand and appreciate their world a whole lot more. 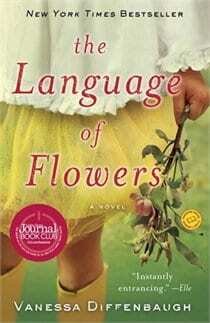 Victoria Jones is a former foster child struggling be close to anyone and find a place for herself in the world when she discovers her gift for the language of flowers. The book follows Victoria as she helps people find their way through the flowers she chooses for them, and as she encounters a stranger that helps her see she might want more in life. It is a beautiful story that is easy to read and engaging, and at the back of the book is a dictionary with the meanings of different flowers – a huge bonus if you love flowers or love to garden. This is one of the best books I have ever read. It follows Tom and Isabel Sherbourne, a young couple that keep the lighthouse on an isolated, remote Australian island. Several miscarriages were robbing Isabel of her spirit until one day, a boat washes up on the island with a dead man and a living baby. This story follows their decisions that day, and the consequences that arise. This is a moving, unforgettable story that is so well written and told. Every chapter is engaging; every character likable. I stumbled upon this book and read it in two days. If you read anything from 2012, read The Light Between Oceans. 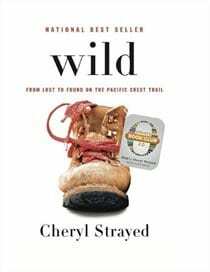 This is Cheryl’s memoir, retelling her adventures as she hikes the Pacific Coast Trail completely alone in her early-20s. Cheryl made the decision to hike through three states after losing her mother and losing her way in bad relationships and with heroine. She starts her hike naive, unprepared but ready for a life altering experience. While the book starts slow with the history of her mom and her relationships, it picks up and doesn’t disappoint once she hits the PCT Trail. Her writing is funny, warm, candid and suspenseful. For anyone who has ever felt like they have lost their way, or want more out of life, Wild is worth the read. A good friend and seasoned traveler recommended this book to me and I loved it. Chuck Thompson takes you behind the dirty screen of the travel industry, spilling the secrets and half-truths travel magazines, books and online publishers want and need you to believe. Chuck doesn’t pull any punches. He is descriptive, blunt and fun to read. 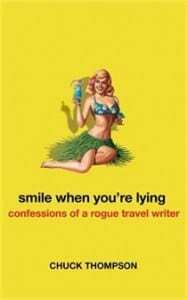 If you like to travel, this is a must read. And if you are Canadian, the ending will make you smile. This is a book written for teens, but as an adult reader, it will capture your heart and make you think. 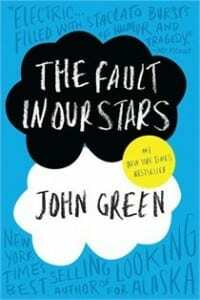 Hazel Grace is a young teenage girl who seems to have only ever known life with terminal cancer. And then she meets and falls in love with Augustus, a handsome teenage boy who also has terminal cancer, at a Cancer Kid Support Group. As their worlds come together, they learn about love, living and dying, and about keeping it all in perspective. The story sounds sad, but it is surprisingly easy and light to read, even though Green is raw and real in how he shares their tale. A great choice for a teenage reader, or an adult who likes their books to entertain and affect them, just a little. Quite literally, this is a story about a man who on his 100th birthday, jumps out of the window of his nursing home in search of adventure, and disappears. 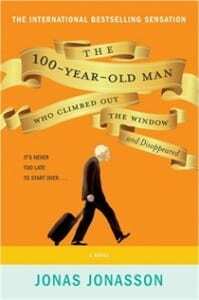 The book follows Allan Karlsson during his escape and reveals that Allan has led a pretty interesting life in his first 100 years. This book is two parts fiction, one part non-fiction as it recounts, from Allan’s perspective, his direct involvement in some of the more important events and influential people in history. PS: If you are on my Christmas list, please do not buy any of these books before Santa comes to visit. “The Fault In Our Stars” is one of my 17 year old’s favourite books. John Green and his brother have inspired an entire movement known as “Nerdfighters” (which, to the uninitiated, are “people not composed of cells and tissue, but instead made entirely of awesome”). I read the book, and was reduced to tears twice – once by Hazel’s story, but also by her mother’s story, a story that is perhaps less poignant if you aren’t actually a mother yourself. I didn’t know about Nerdfighters, but I love the word and love the definition. Thanks for sharing your perspective, Carrie. Thanks for sharing Jennifer. I may use one of these on my next book club selections. If I maybe so bold to add to your list, the book that brought me to my knees this past year, or maybe last, was Sarah’s Key. Story of an American journalist living in France who comes to understand her French family’s connection to the Holocaust. Thank you for sharing your book suggestion, Sonia! I love it when others share their favourite of the year. I have heard good things about Sarah’s Key and I’ll have to check it out. I am one of the lucky to be on the receiving end of your wonderful gift books and you’ve given me two of the best reads of my life, last year The Night Circus and this year The 100 Year Old Man. I’ve already bought three more of Jonasson’s great ~non noir~ to send to my friends… and lent mine to my Mom. I know what you like, what can I say?? Thanks for doing your list again this year. 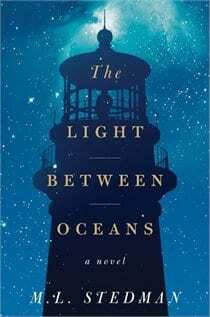 I was stumped as to what to recommend for my book club’s next read – and now I am going to suggest the Light Between Oceans. Interestingly – I had read almost every book on your list last year – and this year I haven’t ready any. What a treat – now I have 7 books to put on my list! Just finished The Light Between Oceans! Can’t wait for bookclub to discuss this. Thanks for the recommendations. I hope you enjoyed the book, Sandra!